A quick and easy version to make, if you don't have the many hours it takes to create a luscious tonkotsu (pork bone) broth, is miso ramen. I use a red miso paste made with soy beans, but there are plenty of other red, white, or yellow varieties made with barley, rice, or buckwheat. Dashi is the soup stock usually used for miso ramen, which can also be quickly made with dashi granules, but you can substitute it with vegetable or chicken stock. As for the other ingredients, I used corn, spinach, and eggs for this basic meatless version. 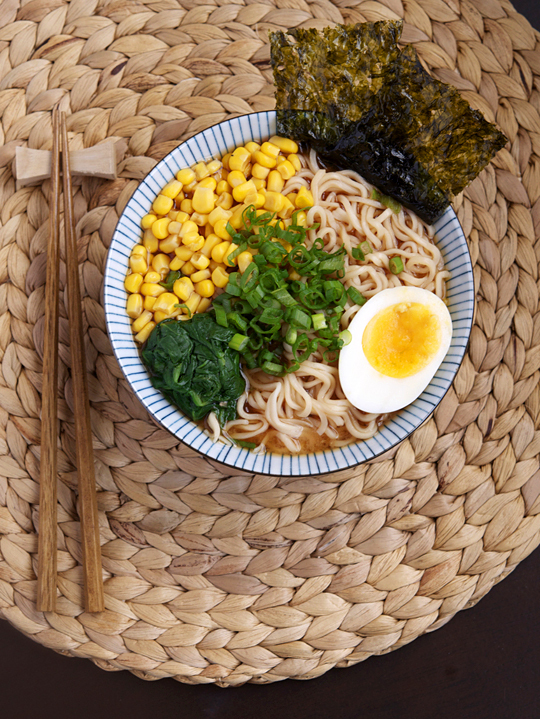 But the beauty of ramen is that you can add or substitute leftovers in your fridge. Tofu, bean sprouts, mushrooms, cabbage, and leftover roast chicken come to mind. You can also be creative with fresh in-season produce. Today I made a delicious bowl of ramen with sautéed ramps in place of raw scallions. And yes, it was a-maze-ing. For the seaweed garnish I like to use a few sheets from the little snack packs like Annie Chun's or Seasnax, which are widely available and MSG-free. Though it is difficult to not snack on them and finish a pack or two before you're done making the ramen. Hide them under a dishtowel if necessary. In a medium pot, cover the eggs with water and bring the water to a boil. Lower the heat to a bare simmer. Cook for 4 to 5 minutes for soft-boiled eggs or 10 minutes for hard-boiled. Remove the eggs with a slotted spoon or mesh strainer and rinse under cold water. Peel the eggs and slice in half. Set aside. Add more water to the pot (enough to cook the spinach) and return to a boil. Blanch the spinach for 1 to 2 minutes, then drain and run under cold water until it’s cool enough to handle. Squeeze the excess water out of the spinach and set aside. 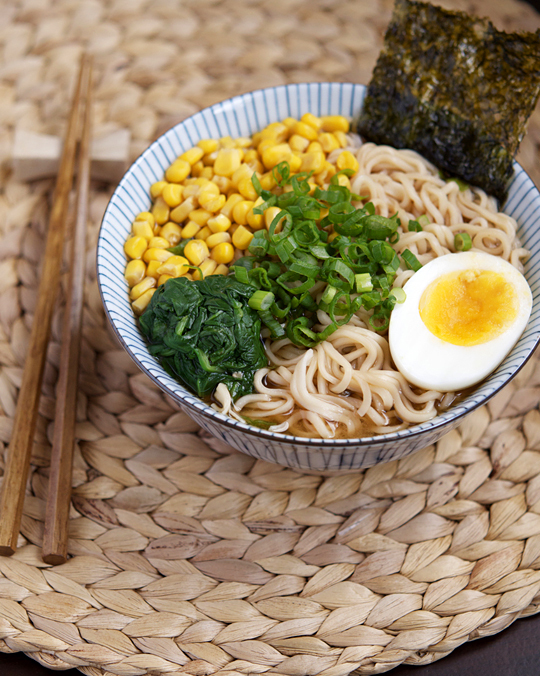 Cook the ramen noodles according to package instructions, either in a pot or microwave. Drain and separate into 2 serving bowls. Bring a pot of dashi, vegetable stock, or chicken stock to boil, then lower to a simmer. Add the miso paste and stir until fully dissolved. Season to taste with soy sauce (miso pastes tend to differ in levels of saltiness, so taste before you add the soy sauce.) Turn off the heat. Pour the soup over the noodles in the bowls. Divide the eggs, spinach, and corn into the serving bowls. Top off each bowl with dried seaweed and chopped scallions and serve.